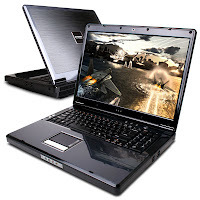 Netbooks might be fun for browsing the web and composing that email to mom but what happens when you want to play a game of Crysis? That's when you turn to the new power house on the block, Cyberpower's new Xplorer X7-Xtreme S1 notebook, which the company claims is the world's fastest gaming laptop and its first laptop based on Intel’s Core i7. The base model of this new beast features an Intel Core i7-920 paired with an Intel X58 + ICH-10R Chipset Mainboard. For optional upgrades you can choose either the i7-950 or for those of you that are looking for some extreme laptop computing you can pack it full of i7-965 Extreme Edition goodness. For graphics you get the Nvidia GTX 280M with 1GB of DDR3 which will be running a 17-inch WUXGA monitor at 1920x1200. Your memory options includes 6 GB (2GBx3) PC3-8500 DDR3-1066 SODIMM Memory, and storage consists of several options the base being a 350 GB HDD. If you want an SSD that'll set you back a pretty penny. Some of the bonus features of the Xtreme S1 are an optional Blu-ray player and an optional 160 GB Intel X25-M 2.5 inch SATA Gaming MLC Solid State Disk (Nearly Instant Data Access Technology). There’s no word on how long the Li-Ion battery is going to last but with all that power you can bet its not going to last long. Pricing for this monster is going to be costly with the base model setting you back $2335.